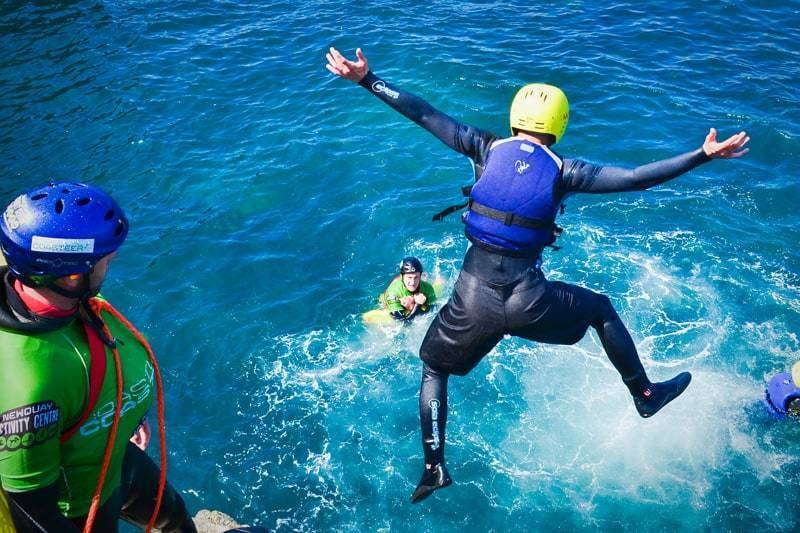 Coasteering is the ultimate way to get hands-on with our rugged coastal landscape. Enhance your skills by enrolling on this course and be trained by the UK and Irelands most experienced providers at Newquay Activity Centre. This course provides extensive instruction from our highly experienced team of industry experts, to fully equip you for the world of commercial coasteering. A combination of mountaineering and coastal orienteering, coasteering is a growing pursuit that involves exploring the inter-tidal zone between high and low tides. As a coasteer guide you’ll be responsible for teaching both water and land based skills, establishing the route and assessing varying weather and swell conditions. This course is run in accordance with the National Coasteering Charter (NCC) guidelines and the National Water Safety Forum’s best practice guidance. They will equip you with the essential skills to confidently enter the world of commercial coasteering. This course also includes membership to Surf lifesaving Great Britain (SLSGB) and Level 1 Emergency First Aid valid for 2 years. In addition, upon completion of this course, we guarantee you an interview and shadowing hours at Cornwall’s leading coasteering provider, as well as, individualised career development plans.